Are you a stressed out mom of a toddler? I’ve definitely been there. I recently had a bad day with my toddler. He decided to have a meltdown in the supermarket and refused to get into the car seat to go home. As I tried to hold him, he twisted around and hurt my back. We finally got home where he threw his lunch all over the kitchen floor, laughing the whole time. I was an exhausted, frustrated and seriously stressed out mom by the time I managed to put him down for his nap. Life with a toddler can be hard work. Some days are full of smiles, giggles, and cuddles, but other days the tantrums come thick and fast and you have a clingy child attached to your leg all day when you really need some space. It’s easy to become a stressed out mom when you have a toddler. When my son was a baby, I had so much support. Friends and family were frequent visitors, offering to help out with food, babysitting, and support when they could. Postpartum ob-gyn and doctors asked questions about my mood and screened for postpartum depression and anxiety. But after a while, those concerned visits and offers of help stopped. People assume once your baby is a toddler, you no longer need that help. You should be managing your time better now. Your child should be sleeping through the night. You shouldn’t need any extra help. I remember those early months were hard. I appreciated all the help I got from people. But being a mom to a toddler is tough too. By around 18 months, most toddlers start displaying a need to be independent. The “terrible twos” may start around now – a time when your little angel suddenly turns into a little monster and “NO!” becomes their favorite word. This is a time of huge mental and emotional change for your child. They are learning that they are a separate person from you; they can make choices and do things without your help. However, they also find out they have to follow rules. They are unable to fully articulate their needs and feelings, or regulate their emotions at this age. So those misunderstandings and frustrations explode into tantrums and anger. This inevitably leads to a stressed out mom. Unfortunately, tantrums are a common sign that your toddler is going through the terrible twos. Your child is trying to assert his independence and getting frustrated when you don’t understand him or allow him to do what he wants to do. It is a difficult time because he is no longer a baby and shouldn’t be treated like one, but equally, he is not a pre-schooler and doesn’t have the skills to do things without your help. You and your toddler will almost certainly clash at this stage of their development. But there are ways to avoid being a stressed out mom and enjoy your time with your toddler. Once you understand why your darling child has suddenly turned into the Incredible Hulk, you can start to make some adjustments in your approach to dealing with tantrums. Stay calm – Easier said than done, I know, but staying calm is essential to riding out a tantrum quickly. He is feeling overwhelmed with emotion and is not able to control himself. The last thing he needs is you to be a stressed out mom and lose your cool too. He relies on you to be a safe and secure place for him to come back to and if you are shouting and getting upset, that safe place is no longer there. • Keep them safe – Sometimes a tantrum will escalate to the point of aggression. Your child might bite, hit, throw themselves around or put themselves at risk of harm. Make sure there is no nearby danger and stay close by. • Don’t argue or try to reason with them – There’s just no point in arguing with a screaming toddler. They have lost the ability to reason or comprehend what you are saying during a temper tantrum. Cuddle them once they calm down – Most of the time toddlers don’t like being held during a toddler tantrum but once the screaming has stopped, they will need a big hug from mom. 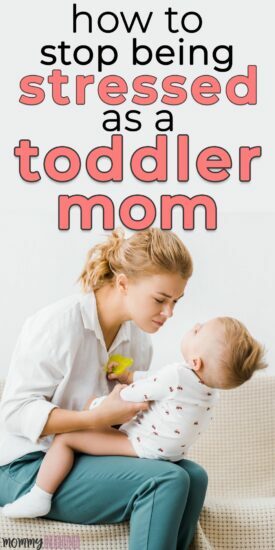 • Don’t reward them for a tantrum – If she threw the tantrum because she couldn’t watch TV, don’t reward her after the tantrum by turning on the TV. • But don’t punish either – If you promised you would take her to the park before the tantrum started, take her to the park. • Learn to recognize the triggers – If he always has a meltdown in the shop because he can’t have sweets, make sure he has a snack before going. Teaching a child rather than punishing them is central to the idea of positive discipline. This allows the parent to focus on showing the child the correct way to do things rather than becoming that angry, stressed out mom we all want to avoid being. Positive discipline starts with the idea that there are no bad kids, just bad behavior. If your toddler throws a toy and breaks it, rather than blaming her – telling her she is a naughty girl – acknowledge that it was her behavior that was bad and tell her that type of behavior is not acceptable. Try to follow this up with explaining to your toddler what they should have done differently. For example, if she threw a toy, help her to understand how we look after our belongings. Maybe if she is unwilling to accept what you say at that moment, try moving her away from the toy – tell her to sit quietly and read a book until she can play nicely with her toy. Treating your toddler with respect and kindness also goes a long way to creating positive discipline. Offer them a choice in how they want to behave correctly – do they want to play with that toy appropriately now or read a book? Make sure there are well-defined boundaries in place so they understand when they are doing something wrong. Of course, toddlers are strong-willed little people and will often do their own thing or have a tantrum! But a positive discipline approach will teach them a better way to behave by treating them with kindness instead of becoming a stressed out mom and yelling at them. When you become a mom, parental anxiety becomes a huge deal. All parents, especially first-time moms, worry about their child’s development, health, and future. Parental anxiety can increase as your baby becomes a toddler. As your toddler goes through different developmental stages, new parenting problems begin. Although all parents go through these stages, sometimes you may feel overwhelmed, stressed and anxious. Before you worry about being a stressed out mom, don’t forget all parents and toddlers go through these stages. How you cope with the stress and deal with your toddler will help you to reduce your anxiety. When you are stressed out as a mom, it’s not easy hiding it from your children. Kids notice everything – more than you probably realize – and they know their mom is stressed out. By managing stress, and not letting it get out of control, it is possible to teach your toddler some great life lessons. Showing your child how resourceful and capable you are, even in difficult situations, you are building their resilience along with your own. It is important to manage your anxiety so it doesn’t become a problem for you or your family. If you are feeling very stressed or anxious, you may need to make an appointment to talk to your doctor. Talk to your partner – Especially about issues involving your kids. Being united in dealing with parenting problems can make a huge difference in how quickly that problem is resolved. Whether it’s potty training your toddler or dealing with a teenager being bullied, working together with your partner will take the pressure off you and show your child your family is a team. Talk to friends and family – It takes a village to raise a child and moms need all the support they can get. Talking about your problems can be a great way to decompress when you’re feeling overwhelmed. Your family and friends might have gone through the same problem with their own kids and have some good advice that you didn’t even think of! Allow yourself some ‘worry time’ – Give yourself the chance to let your mind worry about those little things (or bigger things). Write down your problems, think about them, and come up with a solution if you can. Then put those thoughts out of your mind for the rest of the day. Don’t avoid the problem – Avoidance is very common in anxiety disorders. But as a mom, you probably can’t avoid the trigger of your anxiety. You should face your problem and try to resolve it. This will have a better outcome for you and your child will see how strong and resourceful mom is in dealing with problems. Ask for help if you need it – Whether it is professional help with your toddler’s developmental needs, or a doctor’s help for your anxiety. Don’t be afraid to ask for help. It is not a sign of weakness but a sign of strength. Self care is essential if you want to take care of your family to the best of your ability. When I was a nurse, I was told to look after my own health first because if I was injured or got sick, how could I take care of my patients? Exactly the same thing applies to being a mom, except we are terrible at prioritizing our health. If you are sick, stressed, exhausted or depressed, how will you be able to be the best mom you can be for your kids? Prioritize your health – You know you should look after your physical health but sometimes it’s hard, right? Well, it’s time you made those changes and started taking better care of you. Cut out the crap – Eat a healthy, well-balanced diet and avoid too much sugar, salt and saturated fats. Make a delicious home-cooked meal for yourself and your family instead of ordering takeout again. Get moving – Even if it’s just a daily walk, a weekly yoga class or a swim at the weekend. Start small and build up if you need to, but get your body moving! Practice good sleep hygiene – We’re all busy and sleep is often the first thing that suffers. But if you are regularly missing out on good quality sleep, you will feel tired, stressed and depressed long-term. You will be less able to cope with the demands of your family and work. So switch off your phone, give yourself time to wind down in the evening and get a good night sleep. Journaling – Writing down your thoughts, ideas and worries can be a great way to unwind and de-stress. Just let your pen flow across the page without consciously thinking about what you are writing and see what emerges. Dance – Put some uplifting or inspiring music on, let go of your inhibitions and move to the beat. Dance like no ones watching! Make time for your friends – Call someone now and arrange to meet up. Go for a coffee, a walk, a yoga class or have a drink. Maintaining friendships can be difficult when you have kids, but catching up with girlfriends can stop you from being a stressed out mom. Make a date with your kids – Maybe you could go to a ball game, for a bike ride or spend time at home doing some painting. Strengthen your bond with your kids and you will improve your mental health. Go for a walk – Preferably in nature. Spending just 20 minutes in nature can improve your mood and mental wellbeing. Take the pressure off – If you have become a stressed out mom and you can identify what is causing it, give yourself a break. Cancel that activity out of your schedule and don’t give yourself a hard time over it. Do something you enjoy – Give yourself permission to decompress each day. Take a bath, read a trashy magazine, enjoy a calming cup of chamomile tea. Practice 15 minutes of yoga or meditation when the kids are in bed (or first thing in the morning) and let your worries and anxiety melt away. There will always be challenges and stressful stages in your child’s life, even when they are grown up and left the family home. But how you deal with those stressors and manage your own anxiety is important for your mental wellbeing and the happiness of your family. Being stressed out as a mom to a toddler is totally normal. Give yourself the time and space to reduce your stress and anxiety and you will enjoy this time with your kids even more. This is a guest post from Catherine over at Laid Back Mama. Catherine is a blogger, writer and registered mental health nurse. She is now a stay-at-home mum living in Kent with her 18 month-old son. Her blog Laid Back Mama explores parenting, lifestyle, and wellbeing. She is passionate about improving the health and wellbeing of those she works with. Catherine loves to share her experiences and advice on how to keep positive and relaxed about parenting, reduce stress and enjoy the journey into motherhood. Previous Post: « Is Your Toddler Using Potty to Delay Bedtime? Haha, I stopped reading this after the part where you tell your toddler to sit quietly and read a book after they’ve thrown a toy… I mean, seriously? Maybe some angelic children will actually do that. My super-active, super-strong-willed 2 year old has ‘read’ a book by herself twice so far. Unless flipping through the first three pages doesn’t count as reading a book. Jo – LOL I think flipping through three pages counts! This form of redirection works really well with many toddlers (but you are right – certainly not all!) My three-year-old has sat quietly for a few minutes with a book since she was two, and so this form of redirection works with her. My youngest child is 18 months, and where this would not work with her yet, I will be surprised if it doesn’t when she’s a bit older. She still is a little young to sit for all of storytime, but she brings me books multiple times a day and we read two or three times daily. My girls aren’t angelic or super mellow – but certainly more mellow than some kiddos so perhaps that has something to do with it. I think Catherine is just recommending finding some kind of “calming” activity you can do to diffuse the situation, which I found really useful in my work with kiddos.